Order G is for Gangsta! Introducing my first comedy album, recorded underwater in a basement, G is for Gangsta! One blurb is all you need: HYSTERICAL! -- National Lampoon. Summer Sale! 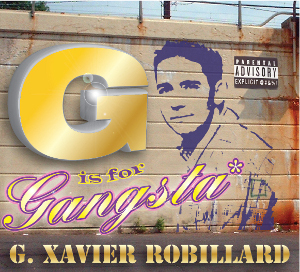 Buy G is for Gangsta for ninety-nine cents at CDBaby! You didn't know about the album? Read the FAQ. You can download the liner notes and album artwork even if you don't buy the album. Not that it'll do you much good. Hey internet, thanks for all the awesome free samples you let me use to make this record! G is For Gangsta was entirely made in my home studio (recorded underwater in my basement while screaming through a Witches Cone). You won't find cheaper comedy anywhere unless you happen to be there when I'm waiting for the bus and my pants fall down.